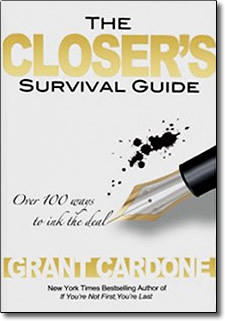 Closer’s Survival Guide by Grant Cardone – Audio CDs or MP3 – Discount! The world is littered with the bodies of sales people who learned enough about selling to make a career of it, but never learned how to close deals consistently in a way to make a success of it. The Close is 20% of your selling time but 100% of your income. The Closer’s Survival Guide audio series contains 8 discs containing 126 of the most powerful closes known to mankind guaranteed to make you a Master Closer. In each of these jam-packed discs, Grant personally delivers each close with his usual flare and style while also giving you the secrets to fully utilize each close so that any objection can be handled quickly and effectively. Closing the sale is the only assurance of rewards. It is not true that you get paid to sell. You are NOT paid to sell. You are only paid to close. Your ability or inability to bring your buyer to a “yes” decision, to quit looking, thinking and stalling and finally close, alone determines your stability and productivity as a sales person. Those that can close love selling and those who cannot close hate it! With The Closer’s Survival Guide audio series, you’ll be able to shut the deal down each time, every time. It’s up to you, either Close or Be Closed. This Program includes 126 Ways to Close the Deal! !